"I should never have had him." Poor Ataru. His mother wishes he'd never been born. His alien wife is constantly zapping him with electric shocks, her cousin continually torches him. His friends all lust after his wife, and he just can't find time to sneak away and chase girls like he ought to. What is the unluckiest boy in the world to do? Disc six of Urursei Yatsura brings an end to the first part of the show with its final episode, plus includes the Spring Special, an hour long program which features a half hour recap with Ataru's mother as narrator. The show changes from its half episode format to single part shows starting with this disc, allowing plots to become more convoluted. The Moriboshi household is seeing double. When Ataru eats a magical manju meant to harness evil spirits, he is beside himself—literally. He splits into two distinct personalities, but even his mother can't identify the authentic one—even Lum and Shinobu are confused when each Ataru promises himself to one of the girls. Could this be the perfect solution to their jealous rivalry? Next, we go from baka to baku, as Ataru finds himself immersed in nightmares after a late night card game. Leave it to Ataru to make a mess of the dream world too. They had been living a quiet, uneventful life. However, as luck would have it, all that would change, when an alien race announced it was planning to invade Earth—and their son Ataru was chosen as the planet's lone defender. His mother recaps the series to date in the first half of the spring special. If you thought it was funny the first time, wait until you see this. The second part finds Ataru lusting after a ninja girl, as the gang heads out on a field trip to Naru, the ancient capital of Japan. This series continues to be a lot of fun, even if, at its most basic, it covers a "disaster of the week" format. The characters are wonderful, and the stories very well written. One never knows what mischief is brewing once the opening credits roll. For slapstick adventure with an alien twist, Urursei Yatsura is hard to beat. Image Transfer Review: Originally broadcast in the mid-1980s, the show does exhibit a few video issues that detract from a perfect image. While colors are highly saturated and black levels solid, some colors tend to bleed in places. Rainbows can be found in many areas with tight linework, and with the start of the second part of the series, ghosting becomes an issue, most noticeable in the credits. There are also some interlace artifacts during fast movement. These caveats aside, this looks pretty good for a show this age. Audio Transfer Review: Outside some audible hiss, the mono Japanese soundtrack is presented well, with a fairly full-bodied soundtrack. Dialogue is clear except for a couple of instances where it is slightly edgy, and background music sounds very good. Extras Review: Chapter stops are available for the start of each episode. Want to see something shocking? Check out these two 30-second safety ads for the Kansei Electric company, featuring Urusei Yatsura characters. These are actually real commercials. Three sheets of liner notes come with the disc, explaining many of the cultural references and language puns used in the show. Lyrics for the new end credit theme, plus an early version of a later end credit song are also included. Mendou gets his turn in the bio section. 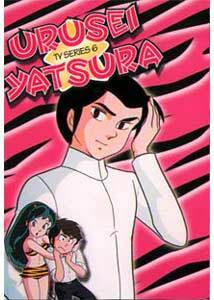 Another collection of weird and whacky comic misadventures, including a series recap reintroducing all the characters, mark this transitional disc in the Urusei Yatsura series. The supplemental TV ads are a treat this time out. While the show may not be for everyone, those who can appreciate its warped sense of humor have an ample library to enjoy.